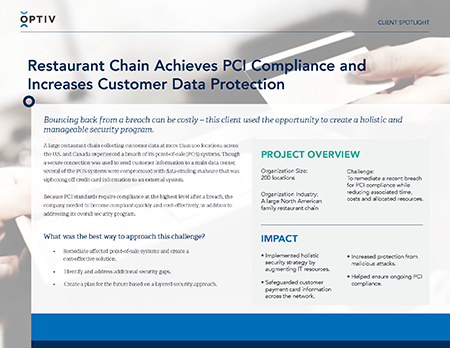 A family-oriented restaurant chain collecting customer data at more than 200 locations experienced a breach and needed to remediate for PCI compliance while reducing time, costs and allocated resources. The restaurant was using a point-of-sale (POS) system at each location to collect customer data. Though a secure connection was used to send customer data to a main data center for processing and archiving, several of the POS systems were compromised with data-stealing malware. Read about how the company worked with Optiv to protect its network.